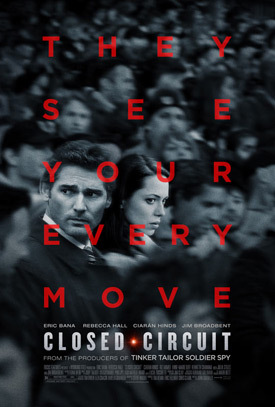 Eric Bana, Rebecca Hall, Julia Stiles and Jim Broadbent star in the terrorism investigation thriller Closed Circuit. See the movie trailer and poster below. A high-profile terrorism case unexpectedly binds together two ex-lovers on the defense team – testing the limits of their loyalties and placing their lives in jeopardy. Running Time: 1 hr. 36 min. MPAA Rating: (R) for language and brief violence. Following a mysterious explosion in a busy London market, the police swoop in, a suspect is detained, and the country prepares for one of the most high-profile trials in British history. Two exceptional lawyers with a romantic past step into a dangerous web of secrets and lies, and when evidence points to a possible British Secret Service cover up, it’s not just their reputations but their lives that are at stake.